We do not provide meaningless warranties & guarantees. What Waterproofing Products to Use? 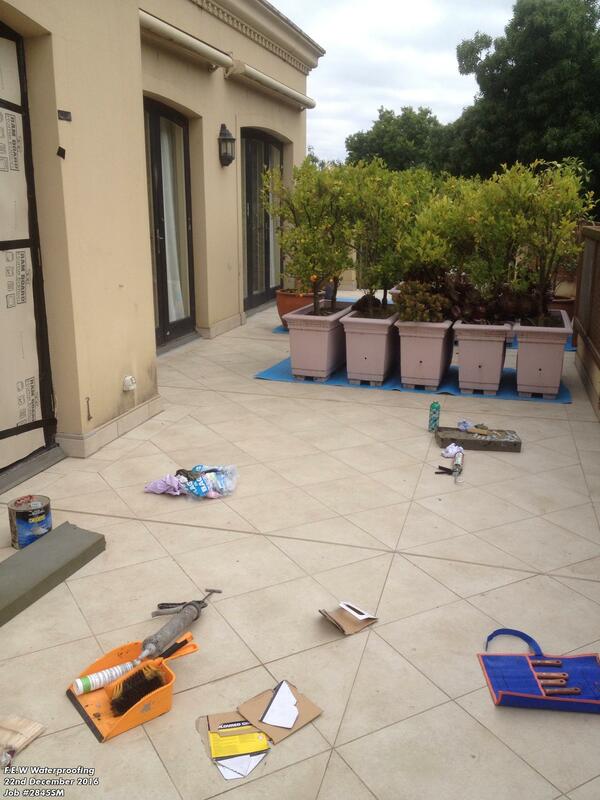 It does not matter if a project is large or small, getting waterproofing right the first time is vital. 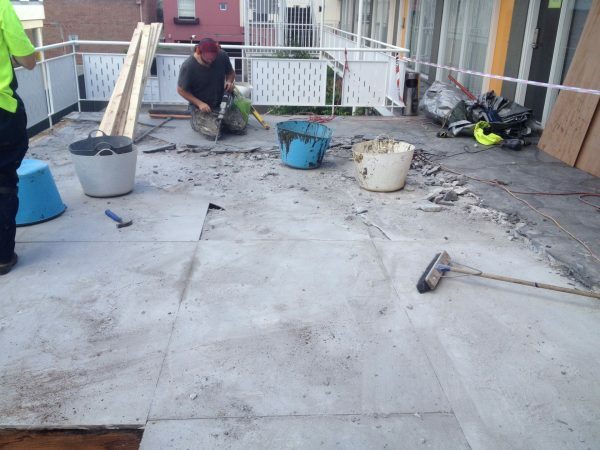 Failure of a waterproofing system can be costly to rectify. Water leaks can result in significant damage to the building envelope. 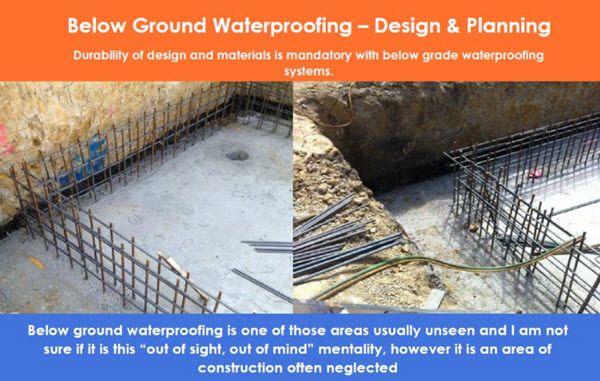 Whether you are a large commercial contractor who tenders for multi million dollar contracts, or a contractor building a new house for a private client, it is essential the waterproofing elements of your project are given as much consideration as the foundations the structure sits on. 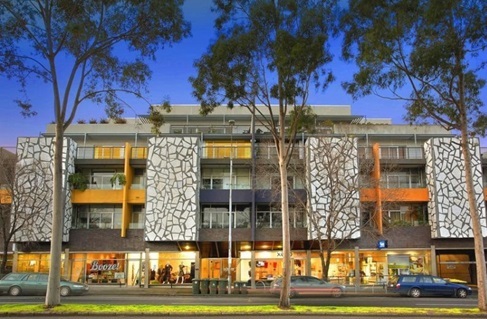 Multi-level apartments requiring balcony repairs & waterproofing remedial works. Insurance companies report waterproofing is approx less than 1% of building costs but water leaks and subsequent water damage represent approx 80% of claims for building defects. Ultimately, the choice of method will depend upon the project requirements - and this includes factors such as the service life required, membrane durability, internal or external, above or below ground and the amount of flexibility required. 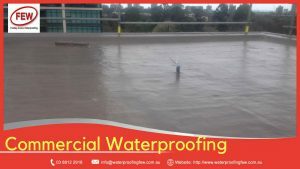 Whatever the chosen waterproofing product, system or method; it is a well established fact that the quality of application has a significant effect on the success or otherwise of a waterproofing installation. 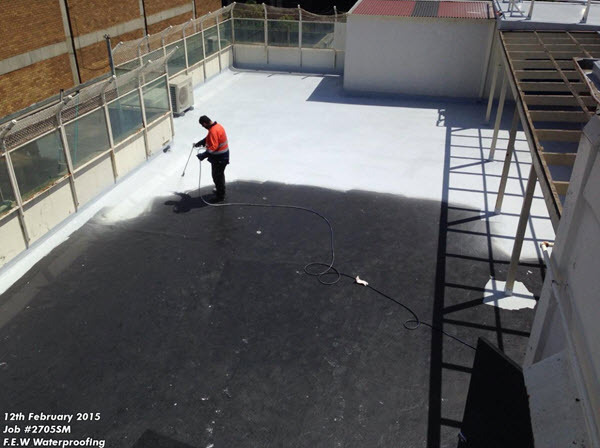 There are numerous waterproofing materials on the market in Australia. However to simplify the issue, there are two main types. 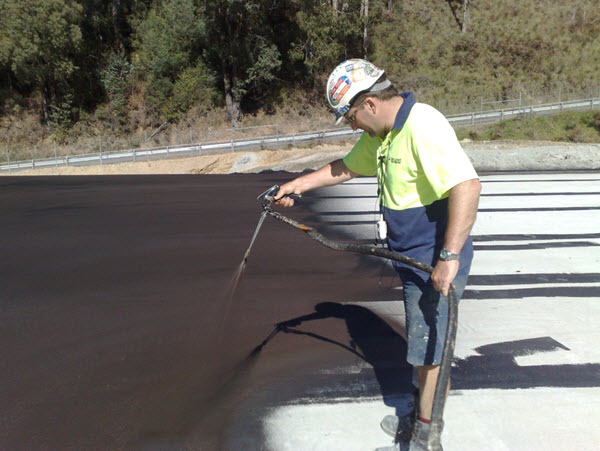 These systems include urethanes, rubbers, plastics and modified asphalts. Fluid-applied membranes are applied in liquid form and cure to form one monolithic seamless membrane. Being liquid means there are no seams or joins to crack, deteriorate or delaminate. Liquid Applied Membranes will conform to any shape of roof, flashing, protrusion, roof penetrations; and both horizontal and vertical. Liquid Applied Membranes (LAMs) are generally considered to be superior to sheet based membranes as they are joint-free. 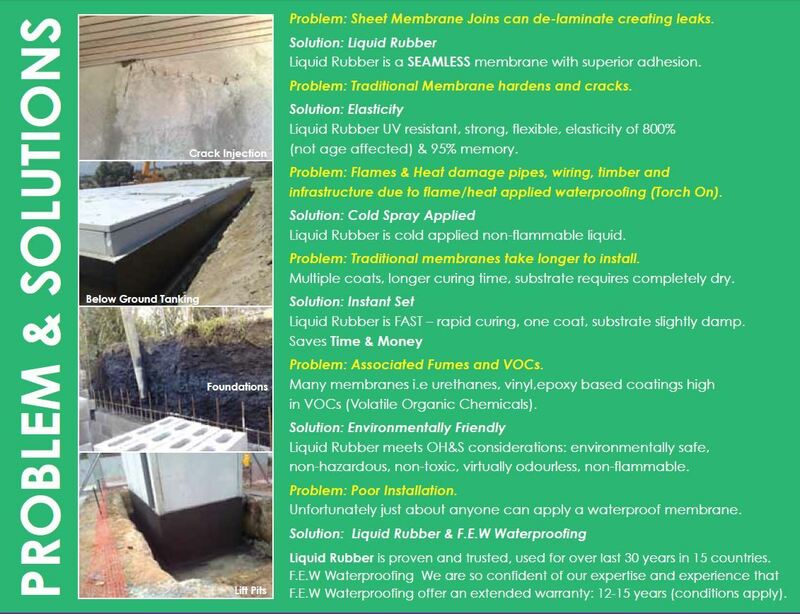 Liquid Membranes can be spray into a continuous seamless barrier providing waterproof protection horizontally, vertically up walls and around upturns, pipes and penetrations. As the name implies, these membranes arrive on site in the form of rolls. 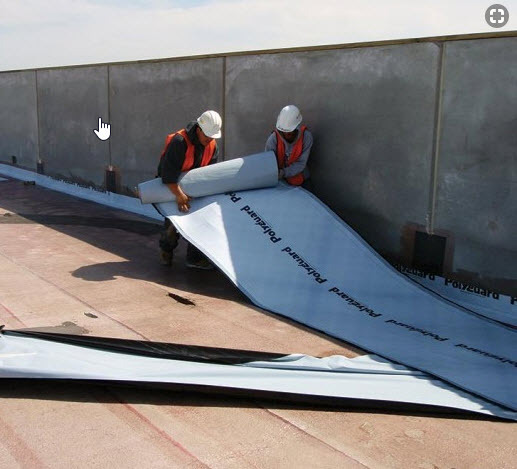 The most common type of sheet based membrane is a bituminous waterproofing membrane. Sheet membranes include thermoplastics, vulcanized rubbers, and rubberized asphalts. Seams between adjacent membranes are joined by melting with a hot air gun and overlapping on the previous laid sheet. 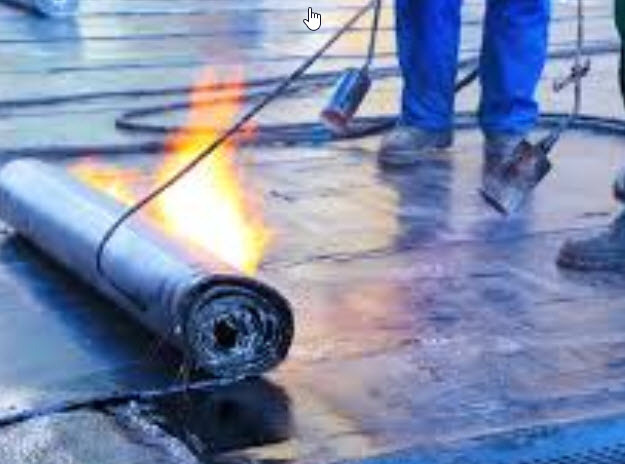 Torch On is a type of sheet membrane that utilises heat-welded seaming. Sheet Membrane -sticky back or glue adhered. Ideally, a waterproofing membrane should be strong, flexible, elastic and tear-resistant so that it can stretch to cover cracks and also move with the building. UV Stability - if the membrane is to be exposed to the sun, than it must be UV stable orUV resistant, else it will degrade in time. Elongation - this is the ability of the membrane to stretch. An elongation of 150% means that the membrane can stretch to 1.5 times its length when pulled. Membranes with elongation properties of over 200% are available. Tear Resistance - this is an important property, as many membranes that have good elongation also can tear easily. You are looking for a membrane that will not tear even if a reasonable force is exerted on it. Abrasion Resistance - this is the ability of a membrane to withstand wear and tear. As most membranes are covered concrete screeds and tiling, the abrasion resistance comes into play during the construction period, when workers are walking on the surface, dropping nails and screws, and scraping hard objects like rebar against the membrane, which can damage it. Chemical Stability - check that the membrane is chemically inert with respect to its environment in the building. 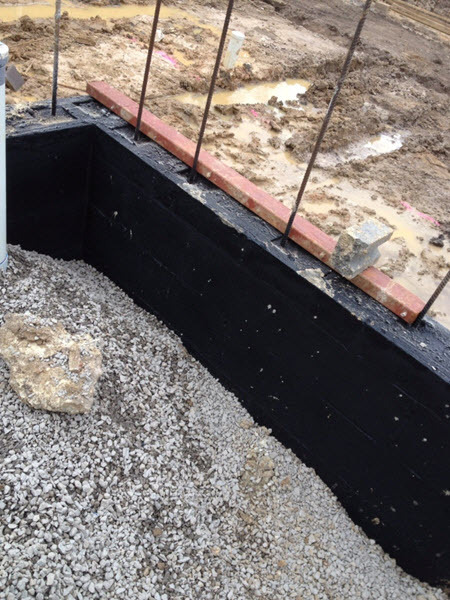 Some membranes, especially outside basement walls, are exposed to the soil and rainwater outside. Geometry - if a membrane has to be installed over a complicated shape, such as the junction of a column and beam, then a liquid applied membrane is preferable, as it can be applied to any type of underlying shape or structure. There are many reasons why balconies leak, however we come across several faults that occur on a regular basis. In our experience, we see many balconies leaking due to poor design, inferior construction methods, incorrect waterproof application, and failed balcony finishes - which is mostly tiles. 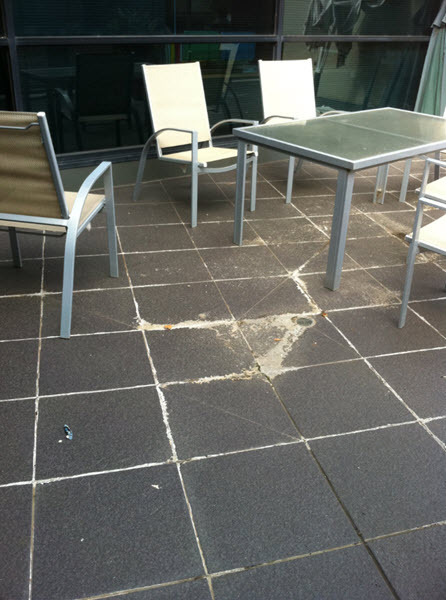 Many builders & trades are unaware of the relationship between balcony tiles and water leaks. If tiles are not installed correctly on a waterproof membrane they will make a perfectly good membrane leak. Tiles expand and contract due to the normal thermal cycle, especially dark coloured tiles. Tiles going undergoing cyclic movement create stress on the waterproofing membrane. 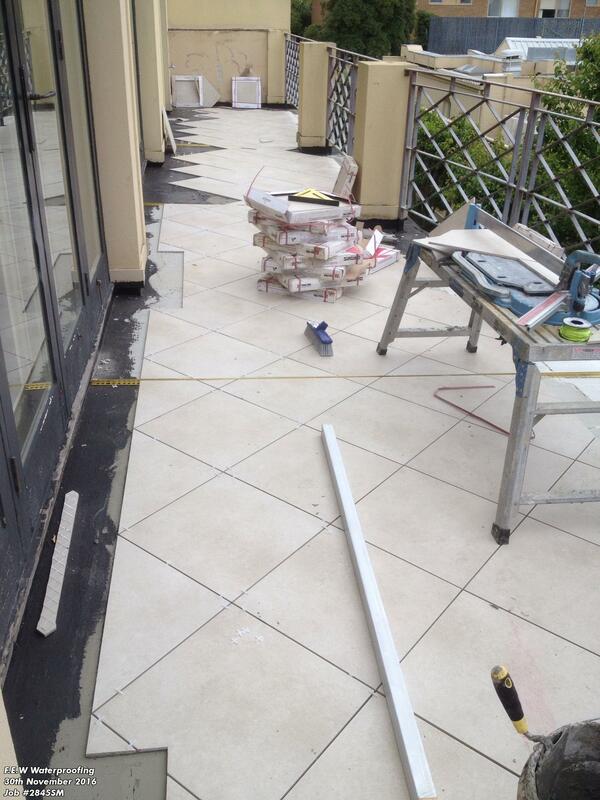 There are methods to enable tiles to cope with building movement - balcony expansion joints. Many leaking balconies require a complete strip off from the existing membrane & back to the substrate. New waterproofing membrane is installed, followed by the finished trafficable surface - i.e tiles or instant turf etc. Using coatings or sealants to fix a leaking balcony without removing the tiles is very often a short term solution - especially if the existing membrane has deteriorated. Expansion joints or lack of them are probably “the” most common cause of a failed balcony – and surprisingly not the waterproof membrane itself. 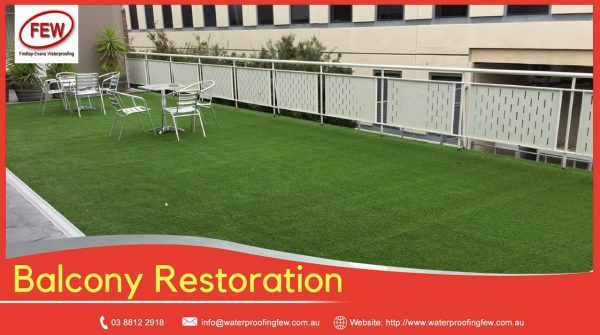 If remedial works are carried out on a balcony and inadequate amount of expansion joints are used - it is very likely the balcony will leak again. 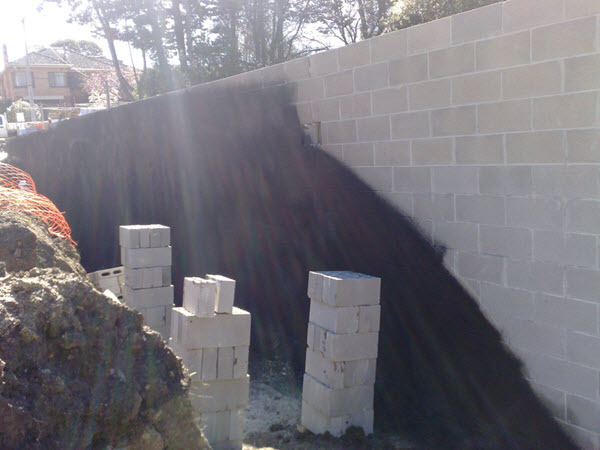 Liquid Applied Membranes are particularly suitable for below ground tanking, retaining walls & gas vapour barriers for mitigating methane & VOC intrusion. 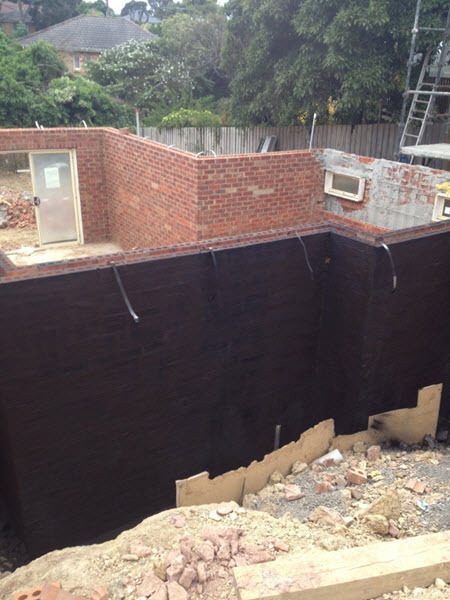 Basement waterproofing membranes are a critical component to make a building watertight. 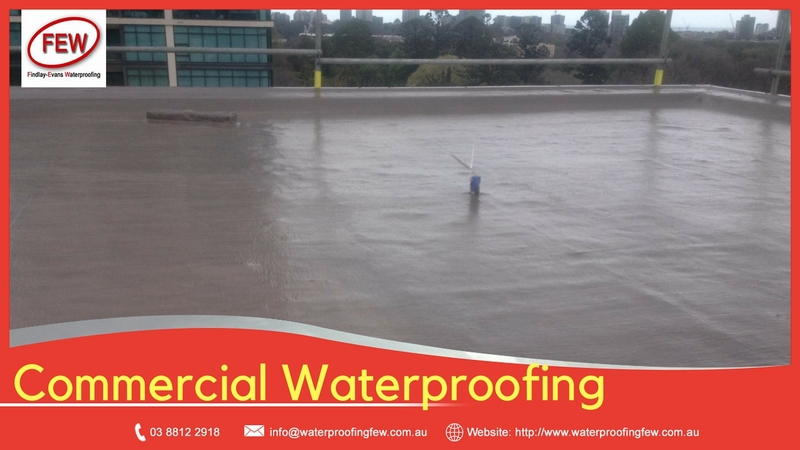 Positive-side waterproofing systems are post-applied to the surface of the element that is directly exposed to moisture, typically the exterior side of the foundation wall. 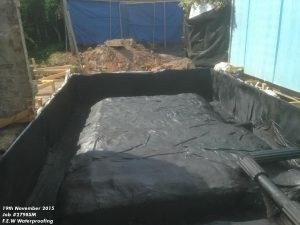 Liquid Applied Waterproofing provides a seamless and flexible membrane for all below ground waterproofing requirements. concrete slabs. Liquid Membranes cure to form a durable barrier & permanent water protection. Waterproofing system engineered for below slab construction. Bonds integrally to poured concrete for use below slabs or basement walls. Remains unaffected by ground settlement beneath slabs. Non-toxic, no VOCs, does not use flames, heat or solvent adhesives for application. Quality roof waterproofing is the most effective insurance you can buy. Water intrusion is the leading reason for construction-related litigation, and can cost thousands or tens of thousands of dollars to fix. Water leaks that don't get addressed early can eventually compromise the entire integrity of the building envelope. This is especially the case with water leaks in roof structure. Roofing works that involve attachments, utilities, equipment or penetrates are modifications to the roof structure and ought to take into account water tightness. Often roofing work performed by trades, most notably HVAC & Solar Installation contractors, may impact the waterproofing integrity of the roof. Installations of solar arrays are an example that may involve dozens of roof penetrations and attachments or up stands. Roof penetrations and holes drilled through the roof surface makes any roof vulnerable to water intrusion. 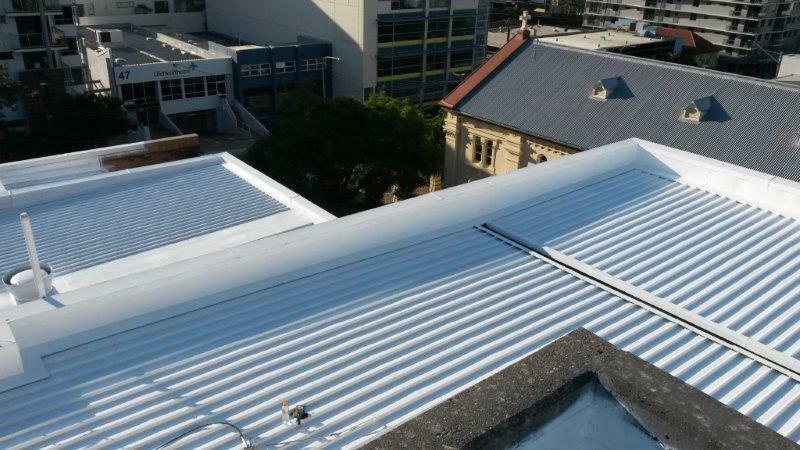 It is vital these roof modifications are made water tight with a reliable and long-term & structurally robust membrane suitable for the life of the roof. 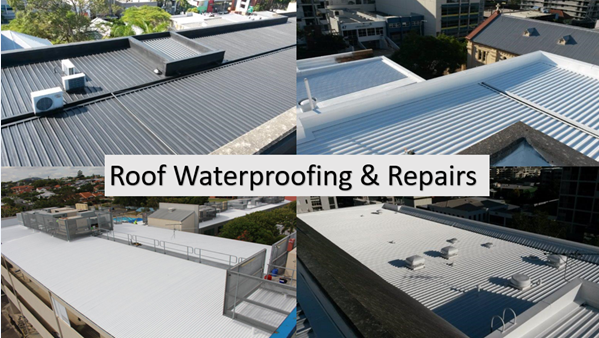 Quality waterproofing ensures roof penetrations do not compromise the integrity of a roofing system. 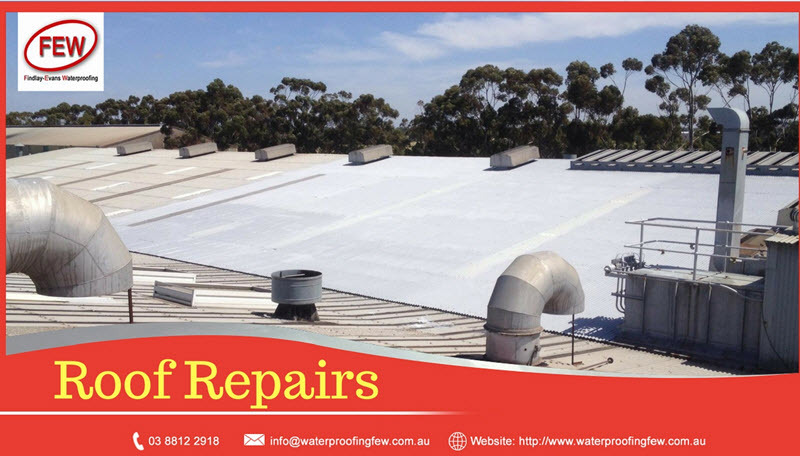 Failure to undertake so, especially on low slope metal commercial roofs, may produce future water leaks and subsequent extensive damage. 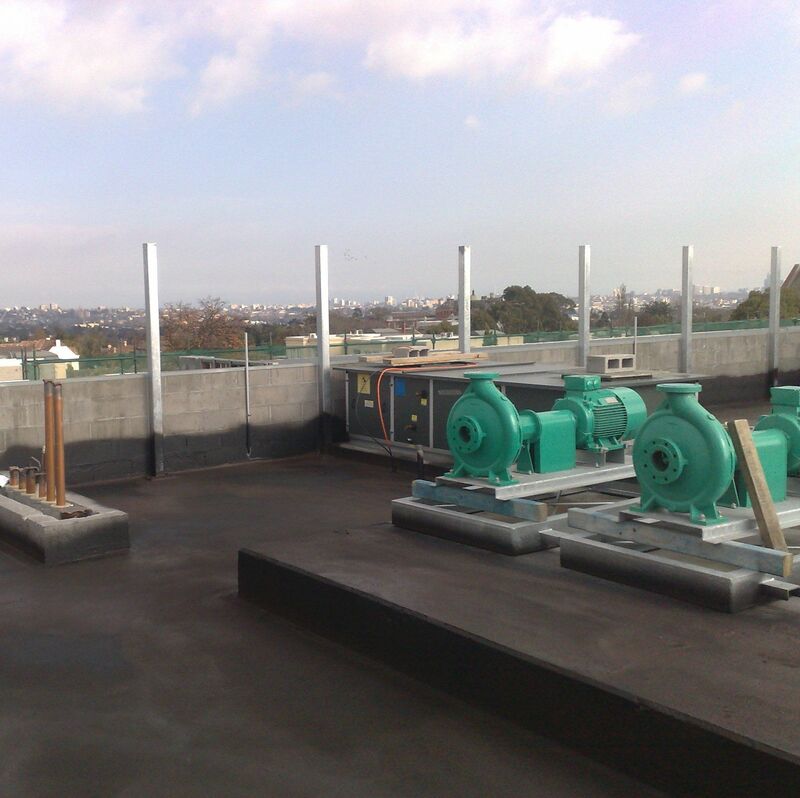 Liquid Applied Membranes (LAMs) are quality elastomeric roof coatings that create a permanent leak-proof roof even with multitude penetrations or equipment. 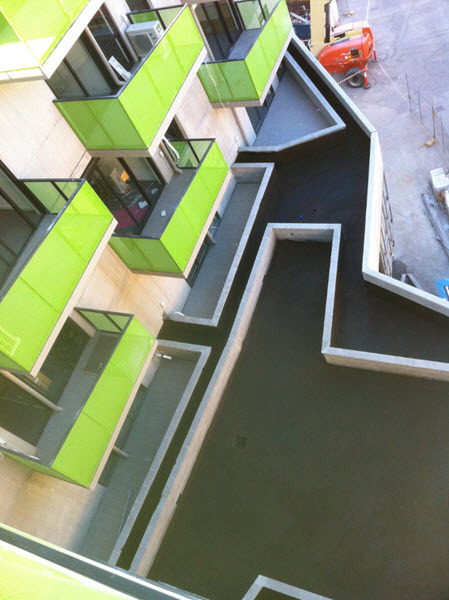 Liquid Waterproofing products, by their very nature being liquid, will comply with any surface, shape or configuration. This is an ideal product for metal roofs as the membrane will coat trim-deck, clip-lock, roof profiles and make water tight around flashings, utilities & roof services. LAMs are a roofing coating that results in a watertight membrane that protects in the heaviest rains and can even withstand "ponding" water. White elastomeric waterproof coatings reduce metal roof surface temperatures and lowers interior cooling. Roof repairs, restoration & remediation can be solved with one single coat of spray- applied liquid waterproofing membrane. 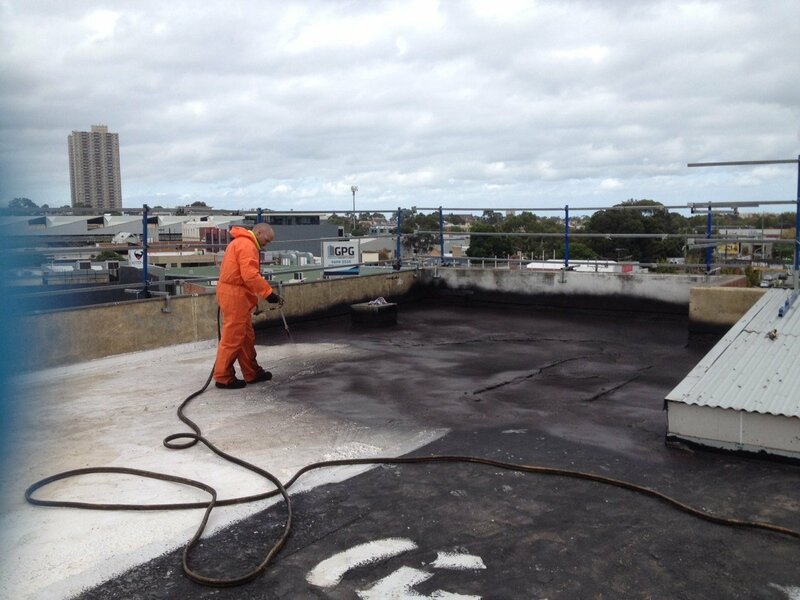 Liquid Rubber can overcoat and completely re-waterproof practically any failed and leaking roof. 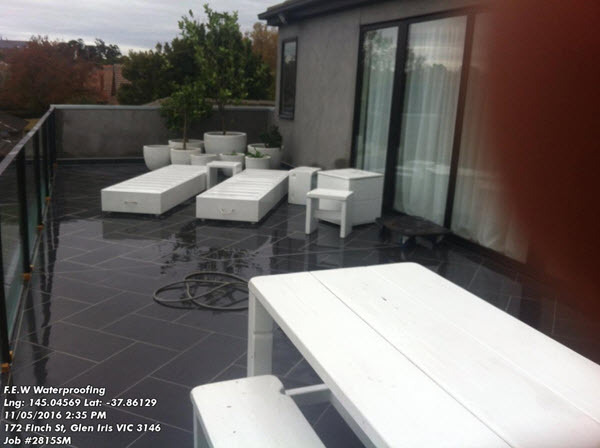 Very often a roof deck can be" busy"; that is there were numerous utilities located on the roof surface. These areas need to be sealed & waterproofed around and under all structures. 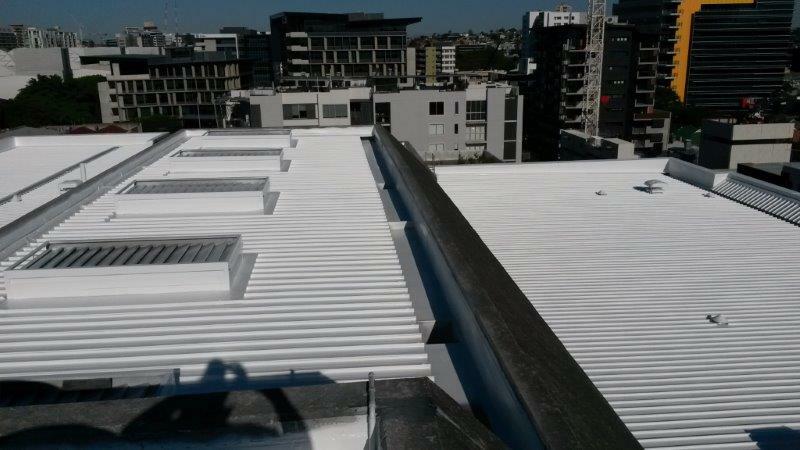 Roof Coatings : Liquid Applied Membranes (LAMs) are particularly suited to roof repairs, as a liquid membrane conforms to any shape that it is sprayed on. Findlay & Evans Waterproofing provide waterproofing solutions to the construction, engineering, mining, agricultural, landscaping, project management maintenance, equine and marine industries to name just a few. 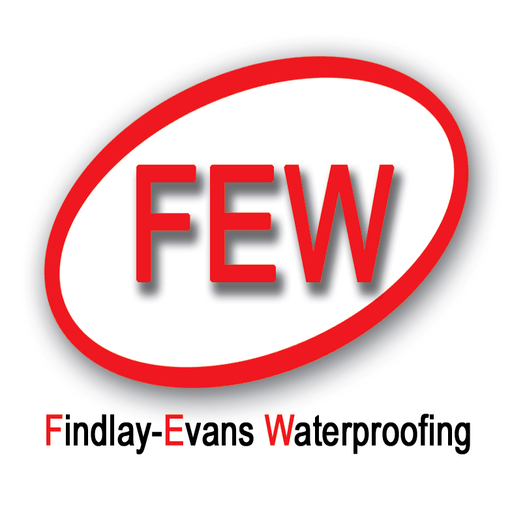 So whether it is a tunnel, water treatment plant, balconies and walkways, green roof, underground facility, parking deck, new roof or the refurbishing of an existing roof Findlay-Evans Waterproofing can offer solutions for your requirements. We offer cost-effective solutions while maintaining best practice standards. Paul Evans is very professional in his approach towards giving the right advice regarding different products he uses and the best product to use for the given task. I would highly recommend Paul and Liquid Rubber to anyone seeking quality work performed by a professional team. Does your waterproofer back you up if the job fails? Paul is very reliable, trustworthy and an extremely valuable source of knowledge. I regularly call upon Paul for advice and information not only with waterproofing issues, but also general construction issues which would arise in the normal day to day course of events in our industry. 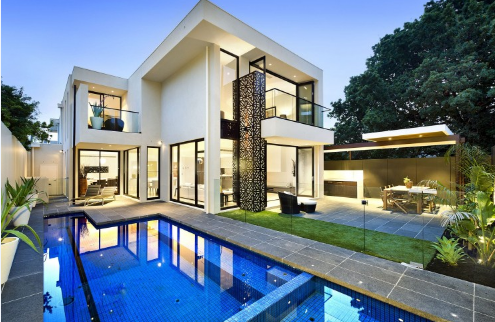 His friendly and professional approach and attention to detail made a somewhat stressful and potential costly situation become a lot easier to deal with; saving both money and more importantly time. 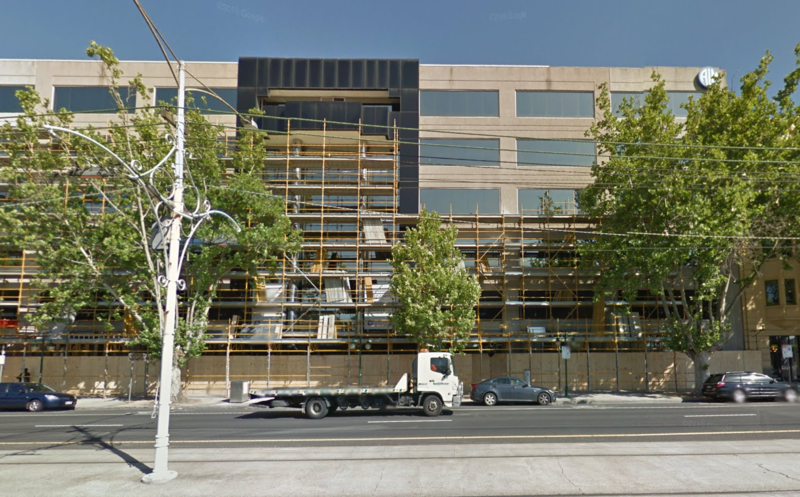 The Australian Institute of Management (AIM) recently engaged F.E.W Waterproofing to resurface the Level 6 plant area which was prone to water leakage. 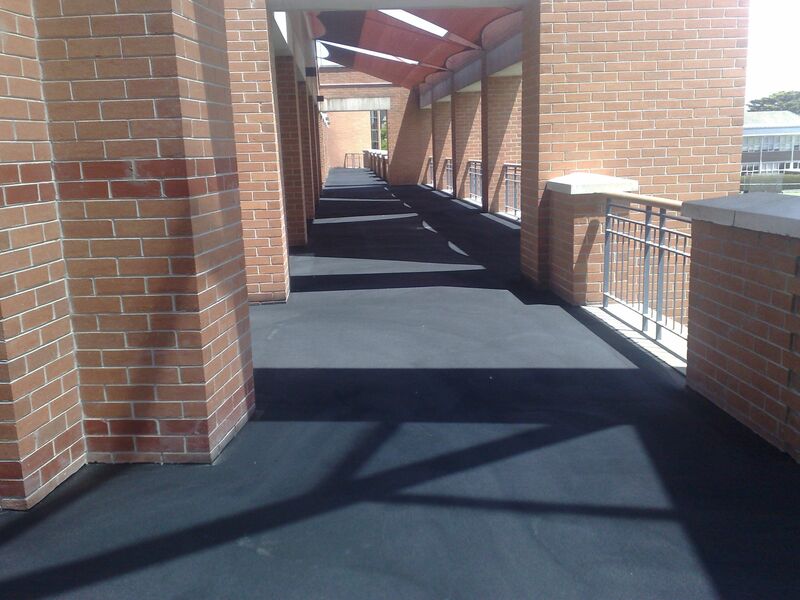 Liquid Rubber was used and is brilliant seamless product; we were very impressed with the finished product. The F.E.W workmanship was of a high standard. Since having the Liquid Rubber laid down we have not experienced any water leaks.